If CVS Health leaders are fazed by a federal judge's ongoing review of their merger, they gave no hint of it at the J.P. Morgan Healthcare Conference on Tuesday. "I want to unequivocally state that CVS Health and Aetna are one company and our transformation work is already underway," CVS Health CEO Larry Merlo told investors during his presentation. In fact, Merlo said the company expects to see the benefits start to accrue in the first quarter of 2019. In the first half of the year, CVS will see benefits from a newly created combined purchasing organization to ensure goods and services fetch "the most effective prices," as well as from formulary and plan design changes, Merlo said. By the end of the year, CVS expects to see medical cost savings, he said, promising a more in-depth presentation to investors in the company's earnings call in February. Eva Boratto, CVS' CFO, echoed Merlo's comments during the company's breakout session. "Clearly as a result of the deal bringing the Aetna business on obviously from a standalone basis is a tailwind for us," she said. Merlo said CVS and Aetna are making "substantial progress" toward integration and are rolling out programs and services that will benefit clients. He said the ongoing review by U.S. District Judge Richard Leon in Washington will not impact the companies' timeline for achieving targets. 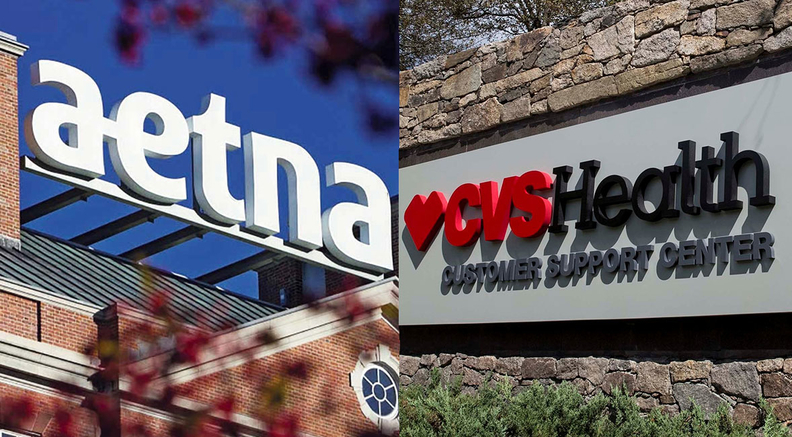 The merger included CVS assuming $8 billion in Aetna's debt, bringing its total outstanding debt to approximately $76 billion, excluding leases, which is on par with CVS' expectations, Merlo said. CVS has $1.2 billion in debt maturing in 2019, and expects an interest expense of about $3.1 billion during the year. The merger is designed to attack the problem of healthcare's fragmentation, Merlo said. The system is designed for episodic care, and patients have to be their own quarterbacks, which often leads to unnecessary, wasteful spending, he said. "Continuing the status quo is simply not an option," he said. "Not for the physical and financial health of consumers, providers, corporations, the government. We can and we must do better." Part of CVS' advantage is the frequency at which patients use its services, Merlo said. Today, CVS engages one in every three Americans, he said. "We have become part of their normal, everyday routines," he said, "and this is critically important because as we think about opportunities, we don't have to build new routines, we simply have to build our programs and services into the existing routines that already exist." Merlo said CVS and Aetna have a clear line of sight toward achieving their goal of more than $750 million in synergies by 2020. Most of that will come from reduced corporate expenses and the integration of operations, he said. During the CVS breakout session, Lisa Gill, head of J.P. Morgan's Healthcare Technology and Distribution team, commented that CVS' Minute Clinic concept seems underutilized. Merlo responded that including them as part of Aetna's plan design could play an important role in increasing their use, as could expanding their scope of practice and adding new services for the treatment of chronic disease. "The good news is there is excess capacity in many of our clinics today," he said.